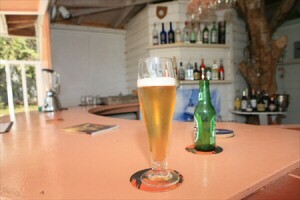 The Ocean Inn is a small hotel resort located hill side over looking the famous Nelson’s Dockyard. 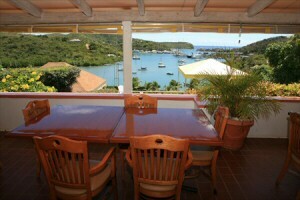 Its proximity to this area means that it is the perfect place to discover the area of English Harbour and the National Park. Breakfast – is provided in your room rate and is server al fresco on our beautiful gallery where there are truly spectacular views across to Nelson’s Dockyard. 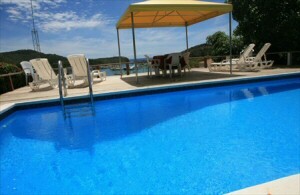 Swimming pool - with sun loungers where you can while away many relaxing hours listening to the birds singing and watching millionaire yachts pulling into the harbour. Honesty Bar – relaxing can be thirsty work so to ensure you keep cool you can help yourself to drink throughout the day, and just write down what you drink – and it will be added to your bill on checking out. Communications – if want to stay connected with the world we offer free WI-Fi access throughout the property, Cable Television in all rooms, and telephone service in the main office. Booking Office – if you want to explore the island, hire a car, cruise the turquoise waters, find out about what’s going on – visit our reception and we will be able to help you plan a varied itinerary. Multi-gym – if you want to stay fit while on vacation, then make use of our small multi-gym to stay in shape. In room service – towels and bedding are provided and there is a daily maid service. Security – Safes in which to keep your valuable items may be rented at a cost of US$3 per day. Steps away from the Ocean Inn you will find some of the best entertainment, sport, activities and people watching on the island of Antigua. Abracadabra – fantastic Italian cuisine early and excellent disco later with costume and one off parties throughout the year. The Dockyard – spend an evening walking around the dockyard stopping off for a rum punch and sit and watch the activity on board luxury yachts, dine at HQ,s the Copper and Lumber Hotel or the Admirals Inn and take an after dinner walk along the dock to see how the rich and famous live. Antigua Yacht Club Marina – the walk to the marina passes excellent restaurant such as Trappas, Mad Mongoose for cheaper fare and Karaoke and ends on the board walk of yet more enormous yachts – and some of the best coffee and ice creams on the island available at Sea Breeze café. Harmony Hall Restaurant & Art Gallery - great food and a truly unique atmosphere in an idyllic setting only 40 minutes drive away. Want to go local – stop at any of the vendors and grills along the way and you will be surprised at how tasty and cheap the food is. If you want to try something different just ask – and all will be explained. You will find nearby access to tennis, squash, yoga, a first class gym, Turkish bath, massages, beauty treatments, hair dressers, and much more. Just ask at or reception for the latest schedules and prices. If you just love to walk there are some excellent treks in the area – Shirley Heights, the Forts, Rendezvous Bay – again ask at reception and they will be able to point you in the right direction. Just remember the sun is incredibly hot, so if you intend to walk in the day please ensure you have a strong sun block and ideally a hat to protect your head, as well as plenty of water. We have two wonderful beaches nearby – Pigeon Beach only 10 minutes walk away, and a great hang our for locals and yachties, and Galleon Beach which is only a 5 minute water taxi out of Nelson’s Dockyard. Banks for changing money, a post office, bakery, gift shops, galleries, a book shop and more can all be found nearby as well as a well stocked supermarket so you are able to buy souvenirs to take home with you.